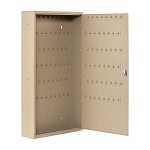 These Key Cabinets are especially designed for motor vehicle keys including cars, trucks, SUVs and RVs. The hook system they use is designed to accommodate larger keys and key fobs and the rows are offset so that the keys will not overlap. They are larger overall, much deeper and have additional space at the bottom - which is very convenient for storing documentation, licenses and other material. But they can be customized for special purposes, such as the large cell keys used in jails and prisons. 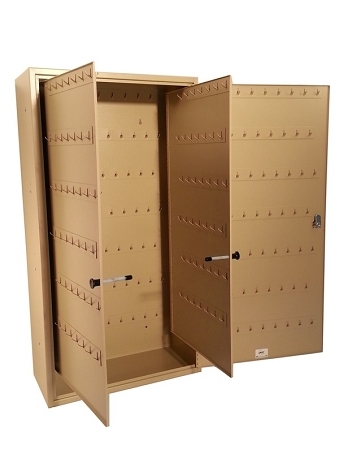 The SteelMaster Motor Vehicle Key Cabinets from MMF are particularly nice. Not only are they expandable with optional panels, they are over-sized in general leaving a lot of room to store other things, like cell phones and wallets. We also offer two optional electronic locks from Codelocks, one that has 3 combinations and the other that allows requiring 2 codes for access. We also have a mechanical combination lock, with key override, from CompX that is another alternative to the standard wafer lock.